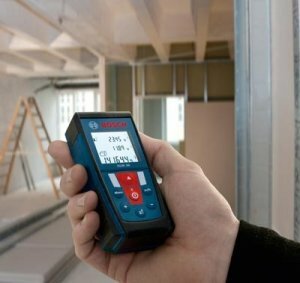 Bosch currently has five different laser distance measurers on the market today, so you would think that they have every customer covered throughout their range. But the original DLR165K is no longer available and it looks like Bosch is going to fill that gap with the new smaller GLM 50 that made its way to us from across the pond. The GLM 50 has the same accuracy of 1/16-inch at 165-feet as the now 4 year old DLR165K, but it has some great new upgrades that were lacking from the original. I think the most important upgrade is the ability to measure in inches; this was something that was missing from the 165K but has been on every model since. It can also measure in feet, and metric measurements as well. A new three line display that has an auto illumination feature should make the laser easier to read in all working conditions. Keeping things simple but still handling the most common measuring tasks, the GLM 50 can measure length, area, volume, continuous, and indirect heights. Three reference points are available: from the front, back and from the center using a tripod mount. Looks like the corner measuring feature did not make it onto this model. Included are a belt pouch and carry loop, two AA batteries and a user manual. There is no word on pricing for the GLM 50 yet.